Summer Tournament 1st & 2nd June 2019. The following should be read in conjunction with the Nunnery Wood Colts (NWC) Club Constitution. These two documents together form a framework for what is expected of Club Officers, Managers, Coaches, Players and Spectators that is to be adhered to at all times. Mandatory requirements are preceded with the word “shall” and guidance with “should”. 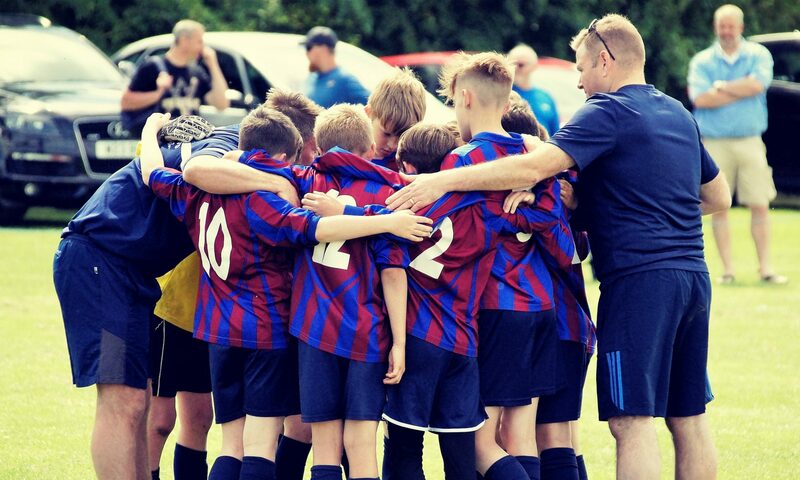 To nurture, develop and release talent in the youth of Worcestershire through football by providing an environment where players feel free to make mistakes and learn to play the beautiful game. This will develop fully rounded players that fulfil their potential in their later teens rather than concentrating on winning at all costs where players can be driven to achieve at age 11 but lose interest by the age of 14 due to a lack of ownership of what should be their game. You will note that in the second season of the smaller formats we suggest you take on more players. These are to ensure you have enough for the following season in which you will move up a format thus needing more players. You are free to take on “Training only” players, in preparation for the following season, that train but do not take part in games. The maximum squad size applies to local leagues only as there is no limit on MJPL squad size. Teams should take enough players to ensure they all get a decent run-out on the pitch whilst adhering to the minimum playing times below. 5 v 5: All matchday players shall get a similar amount of game time in every game. 7 v 7: All squad players shall get a broadly similar amount of playing time over the season. 9 v 9 & 11 v 11: All matchday players shall play at least one half of football per game unless injured or sent off during the game. Note for all formats: If a rota is used due to a large squad it is important that all players get a similar amount of games where available. Teams in the 5 v 5 & 7 v 7 formats shall vary the captain on a week to week basis using performance in the previous week’s game or training to make the decision, which should be fully explained to the team on matchday. 9 v 9 teams should also vary the captain using the same rationale unless there is a stand-out candidate for captain that demonstrates a clear understanding of what is expected of them on a week by week basis. 11 v 11 teams should choose a consistent captain based on the above rationale. Starting line-up should be varied on a week by week basis so no players get to feel like they’re just making up the numbers. 5 v 5 & 7 v 7: This shall be varied and spread out around all the team players with a detailed explanation given at the end of each match. 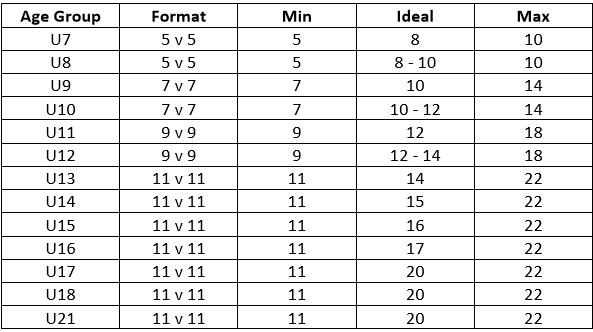 9 v 9: This should be varied and spread out around all the team players with a detailed explanation given at the end of each match where possible. 11 v 11: Should be awarded to the best player on the day with a detailed explanation given at the end of each match where possible. All subs to teams shall be paid by cash for the whole season in advance or standing order over 9 or 12 months. This means for an average payment of £200 per player could be spilt up as £20 signing on fee plus either 12 x £15 or 9 x £20 payments by standing order. The above qualifications shall be kept up to date as dictated by the FA. Currently this means that CRB/DBS checks, Safeguarding Children and Emergency Aid certificates need to be renewed every three years. Managers/coaches should ensure continuity in their qualifications so make sure these are renewed in advance of them expiring. There is no imposed club playing style other than to facilitate variety in play as and when the opportunities present themselves. We do not want to see teams hoofing the ball forward all the time but, equally, we do not want to see teams religiously playing out from the back all the time when there are better options. The style of play should suit the conditions, opportunities and opposition to generate the best chance of getting a positive outcome from the game. Managers should remember that positive outcomes are not solely measured on a games won basis as there are myriad other ways of judging success. There will be inevitable differences where some coaches use more of one style than the others but the aim should be to use all styles to improve coach/player communications and aid player development. Coaches should be as quiet as possible on matchdays limiting input to tactical advice only where possible. The training ground is the place to correct problems with technique. Playing kit – Arrival time – List of selected players – Any upcoming fixtures you’re aware of – Date of NWC tournament – Dates of Christmas do, end of season do etc. Goal kicks shall be taken by the goalkeeper at all times unless they are injured. If the goalkeeper is not very good at taking goal kicks they need to be coached to a level where he can strike a stationary ball and make good decisions where they aim the kick. Goalkeepers who cannot kick a ball will be severely limited in their development. All teams shall wear a club playing strip as advised at the start of the season. All playing and training wear is to be purchased via the club’s Kit Officer. Training kits are open to what’s available but must be badged with the club name and crest. Other club colours/kits are not acceptable on match days or at training sessions. If teams have not official training kit players should either use their playing kit or plain tops with no badging. Any reference to Club means Nunnery Wood Colts FC only. If you want a player that is already signed to another team to play or even train with your team you should contact their manager direct and ask for his permission to talk to the player out of common courtesy to a fellow youth manager. Officially, you should immediately inform the NWC Secretary that you wish to talk to a player signed to another team and he will serve what’s called a “Seven day notice” to the other club by sending an email to their Secretary. You are then free to talk to the player after the seven day notice has expired. Countless problems have occurred in the past with managers “poaching” players from other club teams. This is clearly unacceptable and the following procedure shall be followed in this situation. The manager that wants to talk to the other team’s player shall contact the player’s existing manager as soon as possible once initial contact has been made by the player’s parents or if they want to make an unsolicited approach. If the existing manager is not willing to consider a transfer the manager wanting to approach the other team’s player is to contact the Chairman and make a case to him as to why the transfer should go ahead. The Chairman will then discuss the situation and come to a final decision on the player, which will be binding. Any contravention of this process may lead to a written warning for manager concerned, even if the approach is made by a different parent from the team. Conduct of players, coaches and spectators shall be exemplary when representing NWC at all times, be that at games or anywhere else. This is not intended to be an exhaustive list and the final decision as to the nature of any behaviour shall rest with the Committee. It is assumed by the club that all club players can be photographed whilst playing football. It is therefore the responsibility of individual managers/coaches to let the club know if this is not the case. All managers therefore need to check with their players’ parents at the start of the season whether any of their team players would rather not have their photographs taken by the team and/or club. Every team has its own part of the NWC website on which they can post photos and other football related news on their team’s players, results etc. All posts are subject to vetting by the Committee and if in any doubt about the suitableness of your proposed post please ask. Please be aware that any abuse of any other teams, players, referees is deemed unacceptable so limit any posts to positive views only. This is our “Window to the World” therefore very important that we only post what should be read and not stuff you may regret. League rules are to be followed at all times and take precedence over this document or the NWC Club Constitution, although any discrepancy is to be reported immediately to the Committee. All coaches within the Club shall be licensed by the FA under the FA LCC scheme. This gives the coach access to the online coaching resources provided by the FA including coaching plans and videos. It also provides assurance to players and their parents that each coach has the necessary qualifications. These are provided by NWC for use by all the teams and are to be stored in the correct location depending on playing venue and as directed at the various managers’ meetings etc. Metal goals are to be stored in the nominated locations and kept on their wheels (not on the ground) and locked when not in use. They should be checked before and after every game with the net fixings to be replaced as necessary from the supply of cable ties in the green shed. ensure all parts stay within the bag and bags are to be carried (not dragged) from the storage to the pitch and back again. Respect barriers are to be stored in the correct location, ie. on the shelf next to the respective goals and are to be carefully wound out and up before/after the game. Corner flags should similarly be stored in the correct location. All pitches are to be checked before playing a game to ensure they are safe with no debris, holes or animal faeces over the whole surface to ensure the health and safety of our players. Any damage to pitches is to be reported immediately to a member of the Committee so that it’s rectification can be arranged with the relevant provider. Changing rooms are to be left in a clean and tidy state even if they were messy upon arrival. If the previous user has left them in a state please take photos and provide them to a member of the committee. Cars are to be parked away from emergency access points and as close together as possible. NWC spectators are asked to park away from the ground unless they know in advance that there are not many games on that day. This provides spaces for our visitors’ cars to park on site when they may have come from far afield. There is plenty of parking available on Battenhall Road opposite the old convent school and along Evendine Close so please use it to avoid clogging up the entrance to our ground and annoying our neighbours by blocking their drives. Muddy football boots shall on no account be cleaned on pavements by banging them against the kerbs or our neighbours’ walls. They should be either knocked clean over grass or taken home and cleaned there. There’s no such thing as banter with a child, they don’t get it and will take stuff to heart even if they don’t appear to have done so. Leave it to your mates down the pub. Training sessions are to follow the 70% ball rolling guidance given by the FA. This means that warmups need to involve a ball so no squat thrusts, press-ups or whatever other 70s stuff bad coaches do.